Peruse these Thanksgiving quotes for that special turkey day celebration or to help you have a thankful heart for all of your daily blessings. We have so much to be thankful for! Thanksgiving is the holiday of peace, the celebration of work and the simple life... a true folk-festival that speaks the poetry of the turn of the seasons, the beauty of seedtime and harvest, the ripe product of the year - and the deep, deep connection of all these things with God. Thanksgiving is America's national chow-down feast, the one occasion each year when gluttony becomes a patriotic duty. 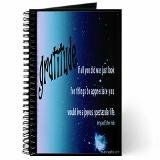 Utilizing a daily gratitude journal is a practice encouraged by the famous celebrity, Oprah Winfrey. you'll end up having more. you will never, ever have enough." Every night, list five things you are grateful for." In our daily lives, we must see that it is not happiness that makes us grateful, but the gratefulness that makes us happy. If all you did was just look for things to appreciate you would live a joyous, spectacular life. None is more impoverished than the one who has no gratitude. Gratitude is a currency that we can mint for ourselves, and spend without fear of bankruptcy. For, after all, put it as we may to ourselves, we are all of us from birth to death guests at a table which we did not spread. The sun, the earth, love, friends, our very breath are parts of the banquet.... Shall we think of the day as a chance to come nearer to our Host, and to find out something of Him who has fed us so long? When I was a kid in Indiana, we thought it would be fun to get a turkey a year ahead of time and feed it and so on for the following Thanksgiving. But by the time Thanksgiving came around, we sort of thought of the turkey as a pet, so we ate the dog. Only kidding. It was the cat. There are a lot of New York City Thanksgiving traditions. For example, a lot of New Yorkers don't buy the frozen Thanksgiving turkey. They prefer to buy the bird live and then push it in front of a subway train. Thanksgiving is an emotional time. People travel thousands of miles to be with people they only see once a year. And then discover once a year is way too often. Got no check books, got no banks. Still I'd like to express my thanks - I got the sun in the morning and the moon at night. On Thanksgiving Day, all over America, families sit down to dinner at the same moment - halftime. Coexistence: what the farmer does with the turkey - until Thanksgiving. I have strong doubts that the first Thanksgiving even remotely resembled the "history" I was told in second grade. But considering that (when it comes to holidays) mainstream America's traditions tend to be over-eating, shopping, or getting drunk, I suppose it's a miracle that the concept of giving thanks even surfaces at all. Thanksgiving, man. Not a good day to be my pants. The thing I'm most thankful for right now is elastic waistbands. I love Thanksgiving turkey. It's the only time in Los Angeles that you see natural breasts. Happiness is the realization of God in the heart. Happiness is the result of praise and thanksgiving, of faith, of acceptance; a quiet tranquil realization of the love of God. It is delightfully easy to thank God for the grace we ourselves have received, but it requires great grace to thank God always for the grace given to others. How wonderful it would be if we could help our children and grandchildren to learn thanksgiving at an early age. Thanksgiving opens the doors. It changes a child’s personality. A child is resentful, negative—or thankful. Thankful children want to give, they radiate happiness, they draw people. Thanksgiving like contentment is a learned attribute. The person who hasn't learned to be content we will not be thankful for he lives with the delusion he deserves more or something better. Thank God every day when you get up that you have something to do that day which must be done whether you like it or not. Being forced to work and forced to do your best will breed in you temperance and self-control, diligence and strength of will, cheerfulness and content, and a hundred virtues, which the idle will never know. The funny thing about Thanksgiving, or any huge meal, is that you spend 12 hours shopping for it and then chopping and cooking and braising and blanching. Then it takes 20 minutes to eat it and everybody sort of sits around in a food coma, and then it takes four hours to clean it up. Imagine the fun of reminiscing and laughing while putting together a puzzle of that special family photo that brings back fond memories. Ah! on Thanksgiving day....When the care-wearied man seeks his mother once more,And the worn matron smiles where the girl smiled before.What moistens the lips and what brightens the eye?What calls back the past, like the rich pumpkin pie? There is one day that is ours. There is one day when all we Americans who are not self-made go back to the old home to eat saleratus biscuits and marvel how much nearer to the porch the old pump looks than it used to. Thanksgiving Day is the one day that is purely American. Forever on Thanksgiving DayThe heart will find the pathway home. It's better to pace yourself throughout a big day like Thanksgiving by having something healthful for breakfast and something light for lunch. If the only prayer you said in your whole life was, ‘thank you,’ that would suffice. Who does not thank for little, will not thank for much. But see, in our open clearings, how golden the melons lie;Enrich them with sweets and spices, and give us the pumpkin-pie! Our rural ancestors, with little blest,Patient of labour when the end was rest,Indulged the day that housed their annual grain,With feasts, and off'rings, and a thankful strain. Thanksgiving is the day when you turn to another family member and say, ‘How long has Mom been drinking like this?’ My Mom, after six Bloody Marys looks at the turkey and goes, ‘Here, kitty, kitty’. For each new morning with its light,For rest and shelter of the night,For health and food, for love and friends,For everything Thy goodness sends. For flowers that bloom about our feet;For tender grass, so fresh, so sweet;For song of bird, and hum of bee; For all things fair we hear or see,Father in heaven, we thank Thee! I awoke this morning with devout thanksgiving for my friends, the old and new. Let us remember that, as much has been given us, much will be expected from us, and that true homage comes from the heart as well as from the lips, and shows itself in deeds. Thanksgiving is nothing if not a glad and reverent lifting of the heart to God in honor and praise for His goodness. Dear Lord; we beg but one boon more:Peace in the hearts of all men living,peace in the whole world this Thanksgiving. Over 30 Fall & Harvest and Thanksgiving games, including all new games and Personalize It! games as well. Answer keys are always included. What's the number one sport viewed on Thanksgiving day? Football, of course! See who will be the first sports fan to match these NFL teams from the clues given. This fun bingo twist is one guests will love! Instead of random words in the squares, type in their names! Guests will be delighted when they hear their name called. Perfect for Thanksgiving holiday parties and of course, Family Reunions. Generator makes multiple cards, just tell it how many guests you have, type in your words, and it makes them all for you! Call card included. That makes it such a treat! Turkey: A large bird whose flesh, when eaten on certain religious anniversaries has the peculiar property of attesting piety and gratitude.